When Should You Refinish Furniture? 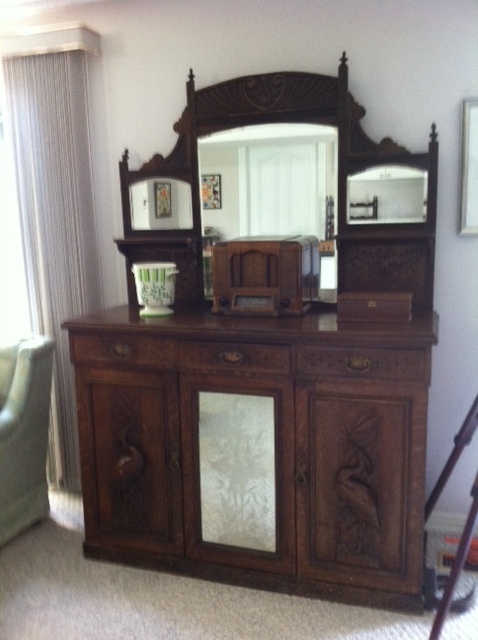 Note the original dark colour of this solid oak sideboard. This is a typical finish for pieces of this time therefor it would match well with other pieces from this era. When is it safe to refinish antique furniture? Most of the time that people ask me this question they are thinking of the effect refinishing their pieces will have on their value at some future date. They have every right to be concerned. Refinishing furniture that is valuable, or rare, or just plain collectible as it is, will result in lowering their values. The worst thing that can happen to a piece of antique furniture is to be refinished because the current owner does not like the colour of the original finish. I have seen countless solid oak rocking chairs that were stained with a lurid red mahogany stain that destroys the value of the piece. So what do you do? Find out what you have by doing research online, in books and by visiting antique malls etc. Is the object desirable, collectible, worth significant money? If so, go no further. Get an official appraisal on the piece, for which you will need to pay. If the value or rarity is significant, go no further. Cheaper yet, take pictures of your piece from different angles and show the damage, if any, to a dealer and get their opinion. Ask them what the effect on value would be if you refinished the piece vs. kept it as is. If it was their furniture piece, would they refinish it? Ask several dealers because some dealers only sell antique furniture that looks like it was made yesterday. If the consensus is to leave it as is, go no further. Ask the dealer or appraiser what it might be worth if and when the piece was refinished. Would it add or subtract value? Let’s say that, based on your research, you’ve decided to refinish the furniture. Now what? Who will do the work? If it’s an inexpensive piece and the surfaces are broad, such as a chest of drawers, you can attempt to do the work yourself. Just make sure that you familiarize yourself with processes and safety procedures. If you decide to pay to get it done, get quotes from furnisher refinishers. Visit their showroom and look at examples of their work, or ask to see pictures of their work. Remember that the value will be adversely affected if the piece is over-finished. I have seen antique tables that were refinished so thoroughly that they looked like reproductions. Refinishers should never touch the underside or back of a piece as that is the first place a collector will look for authentication. Do not listen to the refinisher when they tell you that your piece will double or triple in value after it is refinished. This is sales talk and is usually self serving. After all, in your research you were told what price the piece would fetch if it was refinished. 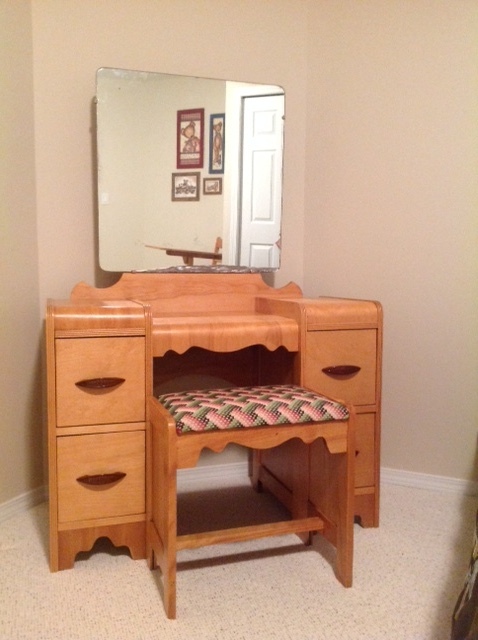 A clear finish shows off the beautiful colour of the maple but the original finish would have been much darker in the 1940’s when this vanity dresser was manufactured. You have done all your homework. You decide to have the piece refinished and you have chosen the perfect refinisher. He or she now asks you what stain colour you would like. This is your final test. What do you do? Choose a stain colour that is the absolute closest to the original. Why? Because anyone who, in the future, may be attracted to furniture of the era of your piece will pass it by because the stain colour you chose did not exist at the time of its original manufacture. If you choose a strange stain colour you will have created a duck out of water and no collector will be interested in what you have to sell when the time comes. Stain colours represent specific periods in the history of furniture. Choose a finish coat that is the absolute closest to the original. Does the furniture have a low lustre finish or a high gloss finish? The trends for different finishes changed with the times and the finish type is part of what makes it belong in a particular era. Never put a high gloss finish on early 20th century solid oak, for example. After all is said and done, sometimes the best thing you can do for a piece of furniture is to refinish it – especially if the choice is whether to throw it away or continue its useful life with a new finish. However, if you’ve taken the steps above you can rest assured that you are not inadvertently ruining the look and value of a significant antique, and as Martha Stewart once said, “that’s a good thing”. ← Do Objects absorb Evil Energy?